LOOKING like whirling surfboards, strange new rotors will furnish the power on a boat now nearing completion at Chicago. Laurence J. Lesh, pioneer aeronautical engineer, is designer of the craft. Unlike the Flettner rotor ship, which attracted wide attention a few years ago, his boat will depend entirely upon the wind for propulsion. No engines will be required to keep the rotors turning, as was the case with the high “chimneys” of the German craft. Once the pointed, vertical wings of the Lesh boat begin spinning, they keep on until the wind dies down or the brakes are applied. The lightest of breezes, tests have shown, will start them whirling and move the ship. For more than a year, Lesh has been experimenting with miniature rotor ships in the model boat basin in Jackson Park, besides conducting various wind-tunnel tests. 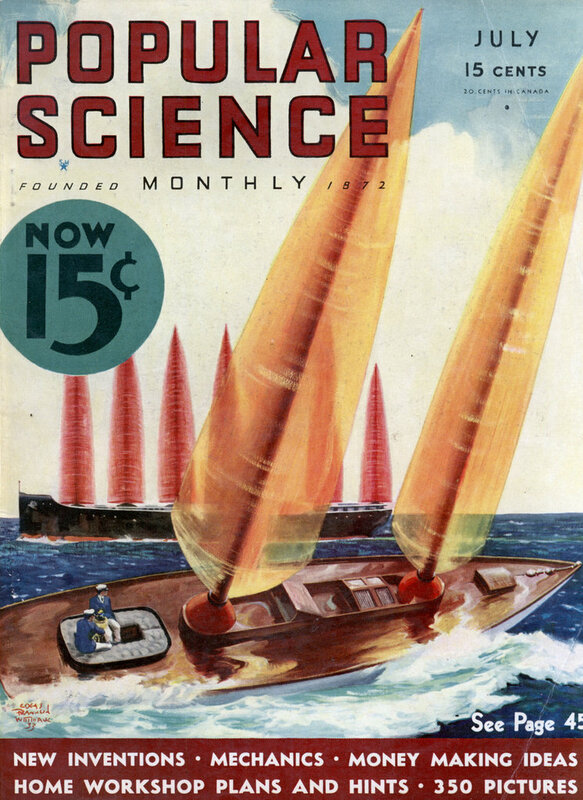 His researches have shown that the spinning wings of his models will pull the boats directly into the teeth of the wind and that they will give almost four times the propelling power of ordinary sails. They spin equally well in either direction, an improvement on the S-shaped rotors of the Finnish inventor, Savonius, which require a complicated mechanism to shift the halves of the rotor when a ship heads about and takes a new course in the opposite direction. The full-sized experimental boat, nearing completion, will be used to try out rotors of various sizes and constructions. Different rotors of the same size will be covered with canvas, plywood, and polished duralumin and tested to discover which material is best suited for the work. To drive a seventy-foot cabin cruiser, Lesh says, three rotors would be needed. Wonder how this would work in a windmill? I hunted all over for this article about 24 years ago when Jacques Cousteau unveiled his windship, the “Alcyone”. One of our reporters went on the trip across the Atlantic on the thing and just went on and on about how new and unusual it was. No one believed me when I suggested something similar had been done in the 1930s but I had seen this article and another one like it reprinted back in the 1970s. “The full-sized experimental boat, nearing completion, will be used to try out rotors of various sizes and constructions.” says the article above. Was the full-size actually done? Does the magazine have a follow up story? I think there would have been ongoing coverage if a US man was improving on the prior work of others. 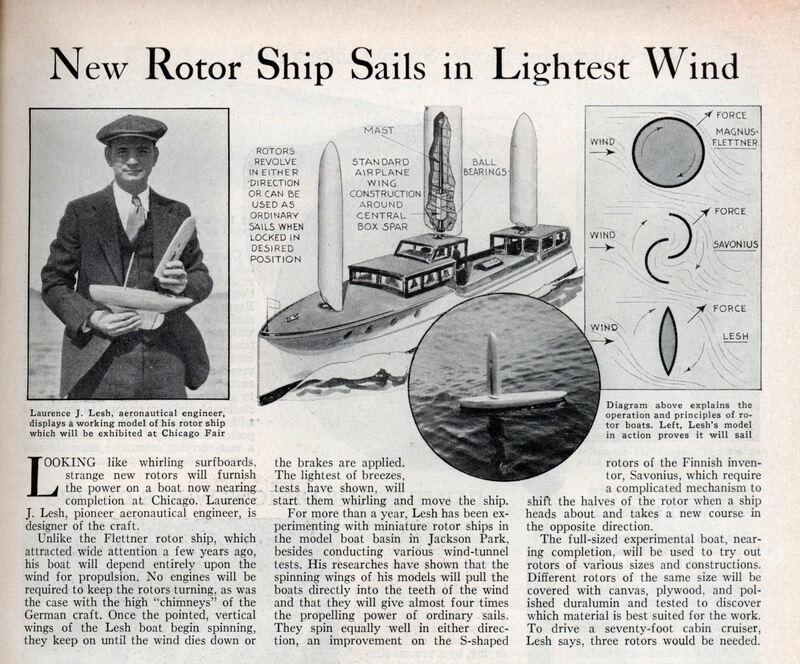 I had seen the article before when I was researching the Flettner Cylinder Mast Sail. But I cannot find reports on anything other than the model as above. There is a discription of Flettner ship in the reprint for “Jane’s All The World’s Fighting Ships-1939” It was used for experiments and research for the German navy. First of all, sorry if my english is bad. But my comment is,like Pat, no news about this after 1933. I think is better than Savoniuos or Flettner devices. I still building a boat 19 feet in lenght using wave propulsion and I like to use also something like this. Please, if somedy knows about a web page with technical information comment here. If wind generators are only 32% efficient and this sail design is 4 times as efficient as normal sails wouldn’t this sail design be vastly better and less obtrusive as a wind generator, especially as it spins even in the lightest of winds when normal turbines do not? Unfortunately, both Rotors and the ‘Lesh’ system exhibit severe turbulence and vibration when incorporated in windmills. Flettner himself built a test windmill, and abandoned the idea.